This treatment kills only the live termites in a particular area using Termidor in either; a spray, foam or dusting application. Treatments for a quick fix for one or two specific areas for example a fence post or stump or affected timber would cost between $220.00 and $440.00. It is important to stress that this treatment is like a Band-Aid solution. It will kill the live termites at the site and the chemical may possibly kill the nest however we cannot offer a guarantee as termite activity needs to be identified, monitored and a full termite program (either Baiting or Barrier) installed for complete termite eradication and assurance. This treatment is usually the first step in a complete termite treatment before a Barrier or Baiting system is installed. Note; Evergreen Pest Management does not use the cheap repellent chemicals that kill on contact as these chemicals do not transfer back to the nests; instead we use the more effective non repellent products designed to completely eradicate the nests (Termidor). Barriers are designed to protect buildings from termites for up to 8 years. The barriers are installed to the Australian Standard. They involve trenching around the building and sometimes drilling of paths and tiles and the application of efficient, stable and long lasting termite treatment chemicals which transfer back to termite nests to eradicate colonies. The latest High Efficiency Termidor chemical which we are accredited to use allows us to provide better protection with less disruption to existing structures with much wider spacing of drill holes required. Great care is taken to ensure that the site is left very tidy; any drill holes are capped with as close colour matching caps as possible. The cost of a full barrier ranges from $2000 to $3900 depending on the size of the perimeter and the type of chemical chosen. 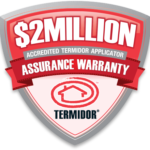 We can offer a $2 million termite timber warrantee with this Australian Standard Treatment. Termite Baiting Programs are installed to the Australian Standards and legislation. Stations are installed discreetly around and throughout the property. They are filled with a termite attractant timber food source. These stations are regularly checked as part of a program and once attacked by termites are treated with a termite bait which is transferred back to kill the nest. They are an effective option to manage termites, use less chemicals and are less disruptive to some buildings and surrounds offering a more environmentally friendly and flexible option for some homes. 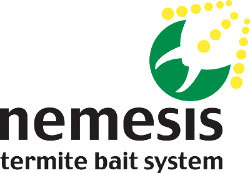 Baiting systems usually cost between $1850 and $2800 and involve monitoring and servicing of these baits.